The weekend saw another internet first. But before that – a little about Gibraltar street names. The two are oddly connected. Partner was walking the dog as usual and someone Spanish stopped to ask directions. This happens all the time. ‘Where is Calle Real?’ they asked in Spanish. Partner gave them directions on how to get to Main Street. Calle Real is the Spanish for Main Street. ‘And what is this street called in Spanish?’ asked the invaders. They were standing on Queensway which is on reclaimed land outside the city walls. ‘It doesn’t have a name in Spanish,’ explained Partner patiently. Now you could translate it into Spanish but this is the whole issue about Gib street names. The old ones have Spanish names, the new ones don’t. Anyway, at this point he got impatient and started speaking to them in English which, of course, they couldn’t understand. Something on the lines of Gibraltar is British and we speak English here. And then the arrogant Brit and the Spanish dog from the campo marched off leaving the bewildered Spaniards to find their way to Calle Real. There is an excellent book called ‘The Streets of Gibraltar’ by Tito Benady which gives some of Gibraltar’s history on a geographical basis and explains the street names. Apparently most of the street names only became official in the 1870s when signs were put up by the police. But, as you dear readers know by now, Gibraltarians are bi-lingual and happily continued to refer to the street names in Spanish which apparently caused more than a bit of confusion to new arrivals in Gibraltar, particularly service staff. Whereupon a list was drawn up of the two sets of names, the official English ones, and the popular Spanish ones. So as you can work out from this, the Spanish street names date back to older Gibraltar and exclude the newer areas. Most of the streets within the city walls have Spanish names, although Calle Real is the one most used. Even my street has a Spanish name. The two other principal streets in Gibraltar that run parallel to Main Street are Irish Town and Engineers Lane/Governor’s Street/Town Range. Irish Town was originally Calle de Santa Ana after a hermitage of that name. Engineer’s Lane was Calle del Gobernado, Governor’s Street was Calle Cordoneros, and Town Range was Calle Cuarteles referring to the barracks. Following Town Range up to Prince Edward’s Gate (1790) you pass a new(ish) block of government houses called St Jago’s. 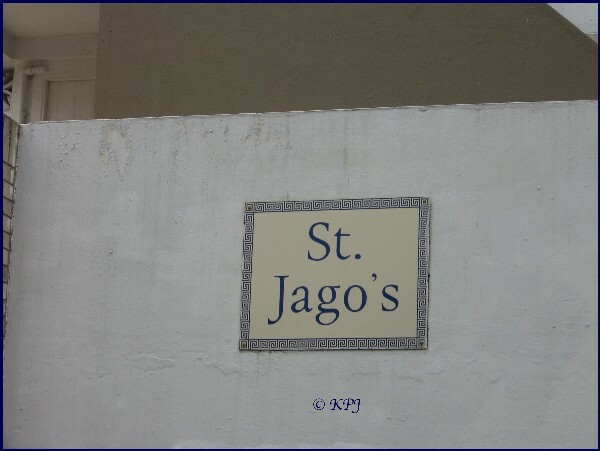 There was an old church of Santiago near the gate and this is where the name St Jago’s comes from. I’d always wondered about that. Pays to know your history. Moving swiftly up to date, Pippa had been asked for a date by The Artist Sofia from my post of a couple of weeks ago. So we all agreed to meet up in the morning before it got too hot for a Sunday walk. Sofia’s mother pointed out that I had mentioned on my blog how charming Sofia was but didn’t say whether or not I liked her parents. Ooops! Sorry about that. In fact, on the walk there are no pictures of cute child with big furry dog because I was too busy talking to her parents while Sofia and Partner were looking after Pippa. How nice it was to go for a walk with interesting people who were so easy to talk to. The time flew by. The last time we took an internet contact (the one I drew a veil over on the earlier post) for a walk, it was moan moan, no interest in the surroundings and nothing to talk about anyway. What a contrast. Sorry Jan. I should have written this post sooner, and saved you the confusion. The confusion caused in the C19th for British military continues to this day whether they are Spanish day trippers or English-speaking visitors. After our walk we enjoyed a coffee at the beautfiul Queensway Marina and an interesting question came up. Are the street names in Spanish as well on the signs? No. All street names are in English. 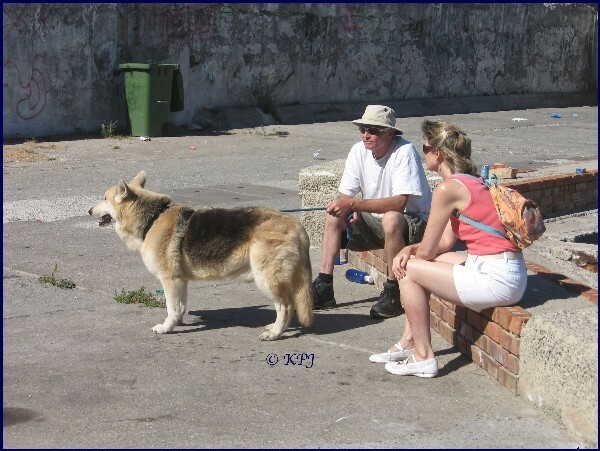 Although most Gibraltarians are bilingual, English is the official language, and English speakers should have no problems anywhere. It just helps to have a little Spanish though. And when you speak enough, you do what everyone does and switch the lenguas. With which, aquí estan los fotos of our walk. I’ve never seen dolphins in Rosia Bay. Ah. People are diving. Looking for dolphins on the seabed maybe? The trouble with having an intelligent child in the party is that they ask difficult questions. ‘What’s that?’ she asked. I didn’t know. Do any of you? (The red thing stuck to the pillar). 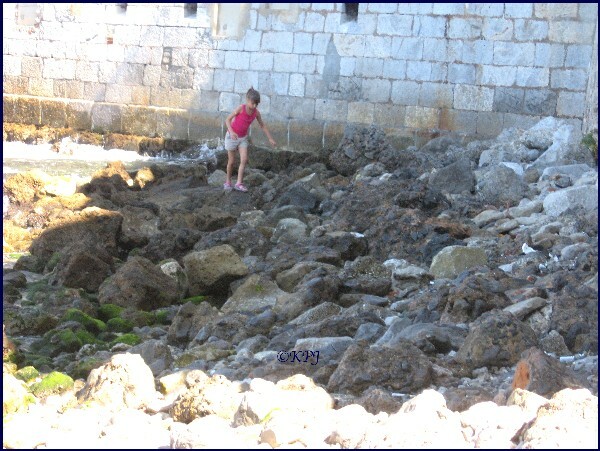 Sofia The Artist has become Sofia The Rock Climber. I used to do that. But with age comes deteriorating eyesight and a poorer sense of balance, so enjoy for as long as you can. Meanwhile the calm and serene half of the party enjoyed the sun. I wandered in the other direction where I had taken a pic of tranquil water a month ago when we watched the flotilla. Same place, same rocks. Not quite so tranquil today. But equally lovely. And Queensway Marina. 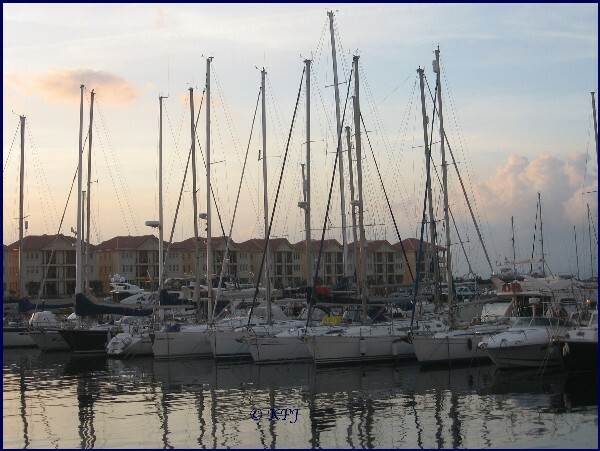 An old photo, because a bit like I didn’t get one of Sofia and Pippa, I was too distracted with the conversation to think about a photo of the marina. My American friend asked me how long it had taken me to learn such good Spanish. Um, that was very nice of her, but given that it took me two goes to get teleferíco, it ain’t that good! I’ll know next time though and at least I knew how to tell them to get there. And that’s life in an English-speaking territory where people speak Spanish. Oh and the internet first? Meeting up with an internet contact for the second time. Looking forward to the next meet-up. Having lived in the French-speaking province of Quebec, this about the street signs sounds somewhat familiar. IF there are any streets with English names [they usually change them to French], they have to be in smaller font. You can’t put up signs in English, because then the language police will come and get you. Did you ever find out what the red thing was? Awesome shot of the marina! No, I haven’t done a search for a red thing on a pillar yet on the internet ;) I was being lazy and waiting for someone to tell me! I love the marina. Different times of day, times of year, the lighting changes so much, but it is always beautiful. Thanks. Canada is officially bilingual country, but Quebec has a lot of exceptions from everything so no, Quebec is French-speaking. They have a lot of Bills with numbers that tells everything … where your kids can go to school et cetera. I never learned French, so I had a bit of a hard time there.. I did learn French, but I didn’t learn anything about North America. Just looked it up and you are right, (of course!) French is the official language. How strange when the Lt Governor represents the Queen of England !! Everything is different there — even the legal system. They have something called Napoleanic Code. Children growing up in truly bilingual areas sort of get a second language for free… that’s so good for them. The education system has changed a lot here. We were explaining to our friends about people being fluent in Spanish but as they didn’t learn it at school they couldn’t read and write it, whereas imports like us could!! Now they have the chance to learn Spanish as one of their school exams so get the opportunity to read and write as well. Much better, given that English and Spanish are in the top three of the world’s most widely used languages. 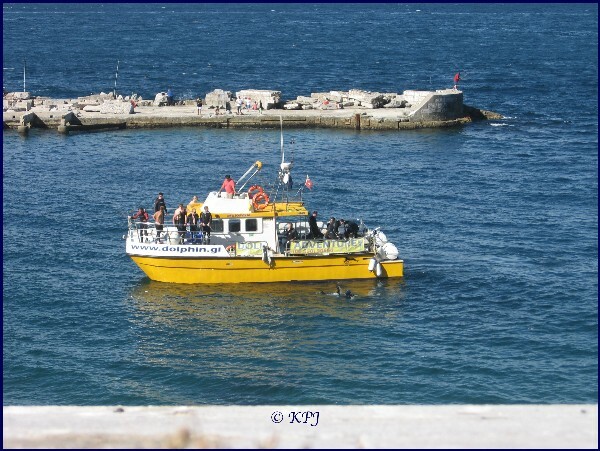 oh, by the way … I see on the dolphin boat that the top level domain for Gibraltar is .gi! Never thought of that before … that they have their own. I could, and it would, and I am too tight (with my money!). Sounds like you had a wonderful walk in good company. Sofia sounds a very intelligent girl, questions questions all the time. Difficult to see how big it is, but the red blob looks a bit like a sea anemone, certainly no expert, but I have seen similar things clinging to rocks in various places. Thanks V. Actually Sofia’s mum said she thought it was an anemone. I’ve never seen one. I thought they were flowery things so was a bit surprised to see it clinging to a rock. I’ve just learnt something too, I always thought they were like a seaweed, I didn’t know they were alive and moved around. Another enjoyable read, and I know if I come to Gib I will have two options one is look you up or keep your postings handy, making them a good reference. The nearest experience I had with similar is on Guernsey and Jersey where it is the French as the second language. I’d forgotten about the channel isles, although did visit Jersey, and you are right, me and my dad did speak French half the time! Interesting reading, and I prefer the whooshy water. Thanks J. I thought it was interesting to see the contrast. I liked them both, the tranquil one was more for gazing at, the whooshy one less so. 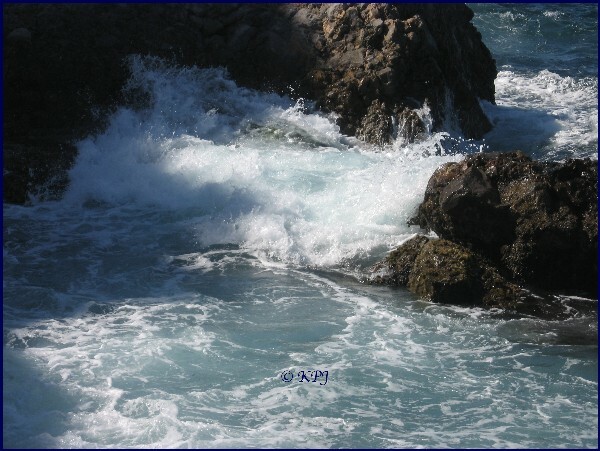 The breeze had picked up yesterday so I guess that explains the white water. Such a frustrating post! First, the not-very-good Catholic girl in me needed to know who St. Jago is. I got to St. Jago dela Vega as a place name, but nothing about a person. Then I tried for the red thing. No luck there either. Santiago – Spanish for St James. My fault, I should have added that. Perhaps the most famous being Santiago de Compostela, and the famous Way of St James walk there. (Bones of the apostle allegedly in the city). Hope that helps the NVG Catholic in you. St Jago is a Gibbo-isation of Santiago, which in turn comes from Sancto Iacobu. Apparently. Up above, Vicky’s link to the sea anemone has pretty well pegged it, I think. A red beadlet one. Thanks for the info. Santiago…Iago…I should have guessed. I never thought to add what it translated to until you asked! Thanks. What’s interesting about the street names is that it is totally historical and unofficial. I don’t know how many people know the names of the smaller streets, but Calle Real is pretty well understood/known by people who live here. Well, assuming they have two words of Spanish. I thought there was somewhere south of Canberra near the border that did have a name in Aboriginal and English on the street sign, but I can’t remember where it was. I’m maybe thinking of Albury Wodonga, but having a quick look, I see the two are actually two different places, although classed as a single settlement. Some countries (Netherlands maybe?) start teaching English in pre-secondary school which is such a smart move. I think that would be a pretty good move for non-English speaking countries. For English ones – Spanish would be the sensible one given its predominance as a language. And then in secondary school, another one of choice, maybe based on nearby geographical neighbours (eg French/German in the UK) or based on local populations so that might mean Vietnamese, Chinese, Arabic, Hindi – whatever. People really are at a disadvantage with limited linguistic skills. I don’t use my Latin much I have to say :D Comes of going to a private school where it was the done thing to learn Latin, classical education and all that. It was quite interesting, and I suppose it is a good base for the Romance languages, but it’s pretty elitist, and a modern European one would have been more use. I agree, and wish I’d had another language (but not Latin) in my early school curriculum or at home but given my heritage this would have been very unlikely! As you commented on one of my posts, the familarity with place names is a lot about being local but in your case you benefit from having the language as well. I tried to get my dad to teach me French at home when I was young (pre-senior school) and only later realised that it wasn’t a case of wouldn’t but couldn’t as he’d forgotten everything apart from bonjour, merci, oui, and zut alors! Pippa is such a monkey. We met some people last night and he totally ignored the guy who was stroking him and just made big eyes at the woman instead. He loves women, so you would be in luck. This is something I am going to encounter when I move to New Orleans. While yes we speak English here, New Orleans is deeply rooted in French culture, hence, most of the strets are in French, the city is divided in areas in French (ie: Treme’, Fauxberg, etc).. I shall have to either get a really good map or start to learn French..
Much enjoyed you taking us on your stroll with you.. Great pics too!!! By the sound of it, I’d recommend a little French. I started with the Spanish by using tapes and I really enjoyed it. It was a lovely walk and so tranquil, it’s nearly always pretty quiet here on a Sunday, so the best day to get out and about. Gib is so busy during the week with the influx of cross-border workers, but on Sunday they obviously don’t come in and on top of that, some Gibraltarians spend the weekend in Spain, so that makes it quieter still. Lovely. Yes, it’s great to see adventurous and fearless girls. And just as good to see supportive parents who don’t say NO! to everything. It makes a big difference to confidence, not just as a child but later on. I need to add quickly, that I’m speaking from a childish perspective and not a parental one of which I know nothing. No time to comment until DH’s mother goes home, but I’m managing to skimread and enjoy your posts. That’s good, thanks. I was just thinking yesterday that I’d not seen any posts from you come up and thought I must check your blog out today to see if I have missed anything. But maybe I haven’t? I managed one quick post a week ago, but since then zilch….. The Queensway name reminds me of the Kingsway Store in Kano, Nigeria where I purchased The Beatles’ (The Beat Boys) “Cry For A Shadow” single on Polydor. Great store for British records. Of course. Remember having coffee in Gib at a small plaza with a number of cafes. Wonderful. Kingsway store sounds like our Imperial Newsagents (I think that’s what it’s called anyway). The small plaza would either have been The Piazza also called John Mackintosh Square, with government buildings around, or more likely Casemates Square near the clock/reloj and just inside the city walls at the north/Spanish end. “Qué?” Oh, yes. Andreas Siegfried Sachs aka, Manuel from Barcelona. He knew nothing. A great character. Thanks for the memories. I find it hard to say Qué without thinking of him. I watched a few youtube clips a while back of Fawlty Towers and was in hysterics. One was based on the linguistic misunderstandings and it really was very clever. It is such a treat to meet people with whom one can ‘click’ immediately – that seems to be getting more rare. Lovely pics of a lovely spot! Thanks M. I think you are right, it is rare. But maybe nice, interesting, intelligent thoughtful people are rare?? I know they’re not, but they’re mostly in hiding! Reblogged this on Lindsay Coleman Site.